This is the transcript of my very first speech with HumanBusiness on the future of work and how the Generation Y is changing it. It is a mix of reflection of my own experiences as well as building on insights of other people. The Generation Y, humans that are born in the early 1980s to late 1990s, which are now at the end of their thirties down to having just entered the workforce. Although over-generalization is always risky business, it offers some help to categorize things in our chaotic world. This Generation Y has received some ugly descriptions like ‘pampered’, ‘entitled’, ‘high maintenance’, ‘lazy’, ‘Generation Me’, with ‘unrealistic expectations’ and an attitude of ‘questioning everything before doing anything’. Seems like we can only be saved by the Millennials to take the spotlight away from us. Joke aside, as I am also part of the Generation Y, I started to wonder is this really true and started to reflect on my own journey. Ironically, I wanted to know Y, sorry why, others would describes us like that. My parents always told me that I could do anything. So eventually I started to believe this and also made experiences that supported that belief. I studied in three different countries, the Netherlands, the United States of America and Sweden, where I also live currently. I am the first person in my family who went to university. 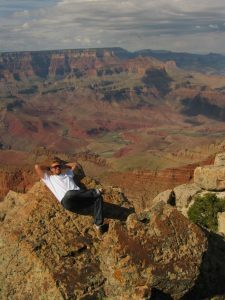 My childhood dream was to go to the U.S. and I achieved that during my studies. International work and study experiences are quite common for my generation and in combination with access to the internet 24/7 we might have become the first generation that is born global. The Generation Y are world citizens. What did I take away form these experiences? Studying in the Netherlands and Sweden, which are culturally quite alike, introduced me to different ways of learning. On the one hand it was very practically oriented, since two internships were part of my curriculum, on the other hand it was very participatory; in basically every course there was some kind of group work involved. I learned to cooperate, experienced and became aware of different cultures, saw things from a different perspective, and generally developed an openness towards the new and unknown. These experiences led to the development of so called ‘soft skills’, which actually are the new hard skills. After my graduation I was ready for my first job. With international experience, soft skills, practical knowledge and new theoretical insights I thought I had everything it would take in the business world. I could not wait to finally apply my knowledge and wanted to make a difference. I thought that work would be like studies, not just parties and night shifts before deadlines, but working together with others, developing solutions, being appreciated for what I know and contribute, as well as respected for stating own opinion or a different perspective. I pretty soon realized that no company has waited for me. How did I find this out? I had to write more than 140 applications. Is this normal? I asked my friends who confirmed that it is normal to do three internships before the first real job. Not surprisingly, many struggled to finance their life. But how can it be different if you need to have five years of experience for an entry level job!? I felt really confused. So what do we do when we are confused? We ask our parents. My parents stated that this is the way it is and that I should simply accept it. Not a very satisfying advise. But we are jumping ahead here. What happened during these job experiences? Eventually I managed to get a job. Thank God the gap in my CV became not too large, which was my biggest concern at that time. The salary was below average, but I was happy to accept, at least it was better than nothing. However, the company was not able to pay regularly. In the end I had to sue them for outstanding salary and bonus, but that is a different story. The company was organized in a classical hierarchical way. 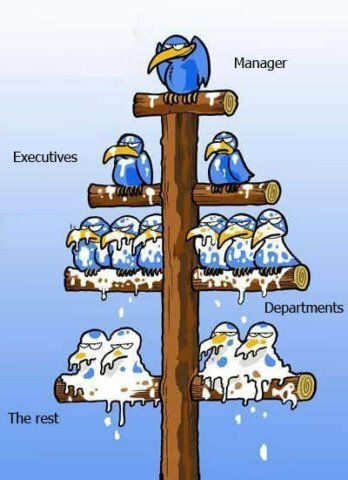 Even though I worked in small companies with only two layers of hierarchy, with me and my boss, I could still feel the different standings in every encounter. What triggered me was that this was simply not designed for collaboration. Orders were coming from above. It was perfect top-down management from a text book. I was told what I had to do, when and how. The flow of communication was only one-way. It felt like hitting a glass ceiling. If my boss did not like my ideas, they would never be implemented. Most of the time it would not even listened to my perspective. All the decisions were made centrally by one person who ‘knows it all’ and oversees the whole company. Naive as I was at that time, I would have expected ‘experts’ in higher level positions, but I pretty soon realized that this is very rare. It is also unrealistic. How can one person manage the increasing complexity? Over time I started to question their expert status and was left speechless with the decisions they have come up more than one time. 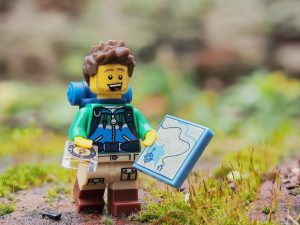 How often have you thought that this senior manager or adult had figured out everything and when you got to know them better you realized that they are lost too? It is okay, we are all lost in some way, we cannot know it all. But it would also not hurt to admit it from time to time. That is the reason which resulted in the quote from above. When managers look down the hierarchy they see only workers not doing things the way they have told them. And when workers look up the hierarchy they see managers who have no clue about what is really going on and why things cannot be handled in the way they proposed. Eventually, everybody is upset and starts blaming the others. My question is: What is cause and what is effect here? And maybe more importantly, who is breaking the vicious circle of pointing fingers first? The reason why the company could not pay me was because there were no customer projects, which lead to me being bored at work. What do we do when we are bored? We check social media or turn to our phone. We know how to be busy, but if it has a positive effect is a different question. How much could be achieved if we would use our Facebook time to create something meaningful. All this time spent on cat videos made me question why I had to be at the office for a specific amount of hours. Why do I have to be there from 9 to 5? Why do I have to work 40 hours a week, when I had only work for maybe ten? Why had I allowed another person to have so much power over me? 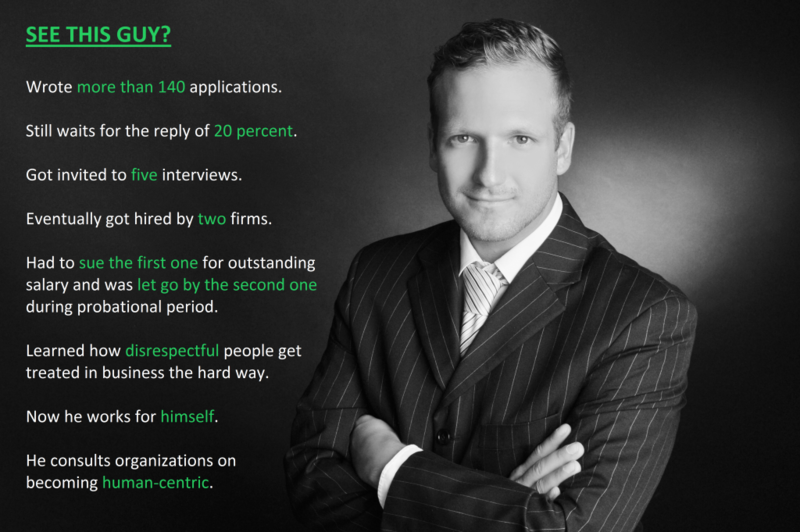 In the consulting industry, where I worked in, it is a common theme to get thrown into the cold water immediately. From day one you work with clients, which means that there is an extreme steep learning curve, if there is work. But it literally means that you are on your own. Either you survive in this competitive environment or drown. This is commonly referred to as the up or our principle. So I get no training on how to do the job, but when I mess up it is my fault? Wouldn’t it be more appropriate to show what is expected of me when I have to do a job the first time? Of course that requires more time upfront, but it also increases the chances of success in the long-term perspective. Let’s come to the favorite topic, our lovely co-workers. Not only a hierarchical structure makes it difficult to collaborate, but especially colleagues who hold back information intentionally. Instead of sharing their expertise and experiences, so that everybody could benefit from it and challenges could get solved faster, they are not willing to share their knowledge just because it makes them look better. They believe it puts them in the position of power and makes them indispensable in the organization. Knowledge is basically kept locked in certain people, positions or departments, like in a silo. But are we in an organization not all working towards the same goal? Should not everybody contribute their best knowledge and effort to collaboratively reach these goals faster? This brings me to the question of why. Why are we operating in a way like this? When I asked my boss or colleagues why things are done in a certain way I got answers like, ‘it was always done like this’, ‘it is tradition’, ‘I don’t know..’. They always got kind of angry with me, because they did not have a satisfying answer for themselves. Don’t shoot the messenger! That is why the Generation Y got this questionable image of questioning everything before doing anything. Older generations often were happy to just have work. Due to high unemployment rates they often did what was told them. They rarely questioned authority. And they achieved a lot. They rebuild whole Germany after World War II for example. They build great infrastructure and increased their quality of life. Thanks to those older generations, we do not have to worry about basic needs like shelter, food or safety anymore. Now comes this young generation, which is better educated and questions everything older generations have achieved. I would be pissed too. But we just want to help. We realize that things are good. We just want them to be even better and build on that foundation. This requires asking uncomfortable questions, necessary to evolve as individuals, organizations and society. We need to dig deep to get to the core problem, because only when we know the cause we can solve it or find solutions that pleases everyone involved. We need upstream solutions. But if they do not want to cooperate, we start to build our own structures. People like Akim, Karolina, Kim, or myself, who have started their own initiatives to change things as they are. People from the Generation Y who are doing things in a different way. Maybe we needed a moment to adjust to this new environment of work, to figure out that this is not the way it should be, from our perspective, and then do something about it. Maybe we can be whatever we want. Maybe we can make the world as we imagine it. But it requires action and effort. After the, in my perception, positive study experiences and the work experiences, which I learned a lot from, I found my self in the position of having two options. I could accept the way we are working. That would mean I had to lower my expectations to a point where I knew I could never be content with. Or, I could try to make change. Look for ways of working that are more suitable for me, my generation and everybody else who works. When I put it like this, it is pretty clear why I started my own company. 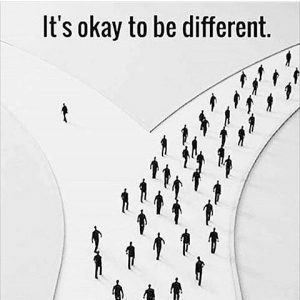 I have the core belief that people act in a certain way, simply because they do not know better or their environment prevents them from acting differently. That is why I, on the one hand, bring consciousness into the way we work and show alternatives, which we will see in a moment. On the other hand I architecture systems or transform existing environments which liberate people and organizational resilience. The way I see it, there are two main challenges. First, there is an unhappy, not driven and disengaged workforce. The focus here is on the individual, who perceives work as meaningless and limiting. Second, there is an systemic reinforcement of these factors in organizations due to outdated management techniques and organizational design from industrial times. These organizational environments with their methods and approaches focus primarily on increasing efficiency and profit, while neglecting basic human needs and even human rights, for example in their production. Therefore, we need to work with both aspects, the individual and the organizational context. This is why the name HumanBusiness seems appropriate, because it focuses on the individual human and the organization, the business. The solution needs to find an approach that combines both interests. Looking at my own experiences I felt lost. I thought I was prepared for working life, but as it turns out I did not have any orientation. What am I suppose to accept? What is ‘normal’? I was unhappy, to put it mildly, with my job. And I am not alone, 84 % of the workforce in Europe is doing a job they do not like fully on a daily basis. It starts with a simple question. Why do we work? We identify ourselves so much with our job position. A common question at basically every social gathering to introduce ourselves is ‘what do you do?’. The answer is often our job title. But this is not who we are. We are much more than our job title. Work seems to play a big role in our lives. We spend on average half of our waking time with work. At the same time we are not really happy with it. Unless we answer this question for ourselves – why do I work – we will never find a satisfying work environment. Without a sense of direction we will either run away from experiences we do not like without knowing where to go. We run from one job to another. We try different company sizes or industries. We might start studying again. Do a gap year or travel the world. All to ‘find ourselves’. Or we rum from one miserable experience to the next with low chances of hitting the jackpot, meaning finding our dream work environment or dream job. We all want to do meaningful work. We want to wake up and know what we are working for and that we contribute to something bigger than ourselves. We want to do something that lets us realize our purpose. But unless we have not answered this question – why do I work – for ourselves, we will not find the answer in any kind of job. Ask yourself, if you would get a basic income of 1.000 € every month, would you continue doing what you do on a daily basis? Most organizations are not really good at providing meaningful environments or allowing individuals to do a purposeful job. You can probably guess the question by now. Why is it like this? Part of the answer lies in the capitalistic system we operate in. The foundation for it was introduced by Adam Smith in his book the Wealth of Nations. He suggested concepts to increase prosperity, which mostly define today’s standard economic practices. One concept was free markets, where demand and supply regulate prices. This is also known as the invisible hand. A free market brings also increased competition. The winner is the one with the highest profits, placing individual interests over anything else. This explains why companies outsource to lower wage countries, which often have no worker rights, or destroy nature in order to make more profit. Another introduced concept was division of labor. Instead of one person doing all the production steps, this person only does a small part of it. This focused attention has lead to specializing and productivity. Think of production plants for cars or different departments of an organization. However, division of labor has also made us lost in the process. We have lost sight of the big picture. We do not realize what product we work on anymore, because we never see the completed final product, who is using it or what the customer does with it and how it affects the customers. I for example needed to develop a social media concept. When I presented it I got a ‘good work’ as response, but I never saw it implemented. I never saw its impact. I assume it is still lying in the drawer of my boss catching dust. I believe it is this connectedness, seeing what we accomplished, who is using it and how it benefits them, gives us a clearer understanding of why we work. How can such a feeling of connectedness be achieved? Right now, we mostly value profit more than anything else, even human well-being. The solution that I offer puts the human into the center of all business activities. In every situation we realize the human individual we are dealing with and how our actions affect them. It essentially comes down to one question: How do we want to treat other people? 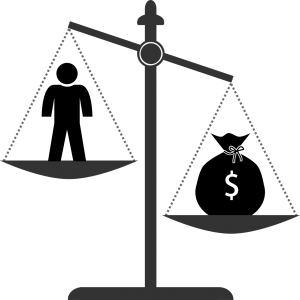 We need to value the impact we have on an individual human being more than profits, so that we can shift the scale to the other side, or at least find a harmonic balance. 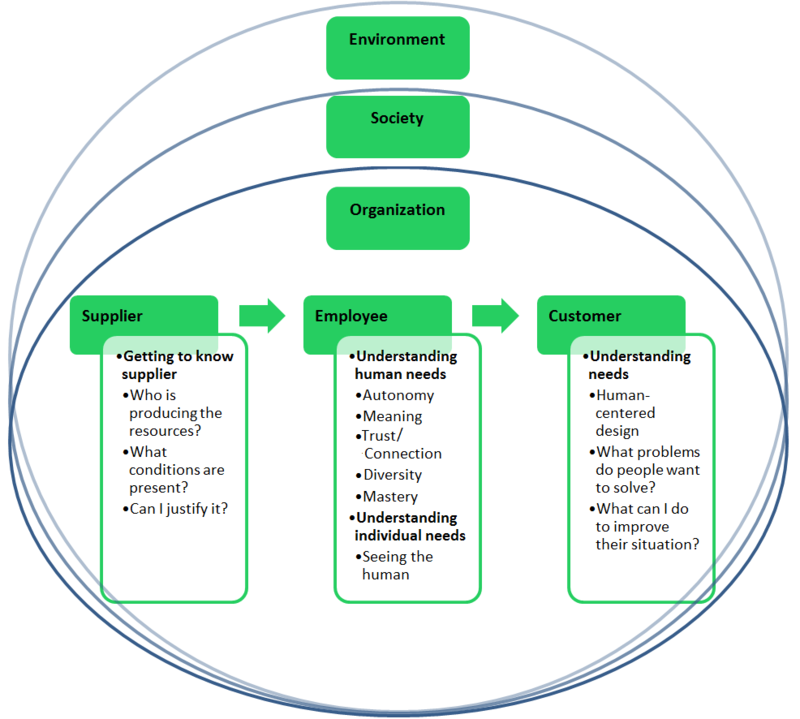 The concept of a human-centric approach can be applied to various context where humans are involved, for example to employees, customers or suppliers. By starting to treat one group with respect and caring about their well-being, there will be ripple effects to other groups, society and the environment. If we put ourselves in the shoes of the human being we are encountering, understand their individual needs and realize the situation they are in, we can develop a sense of empathy and compassion. This prevents us from treating others badly. We can always ask ourselves if we want to be treated like we treat others. The golden rule is simple but effective. For example, if I am a manager and scream at my employees I can ask myself: Do I want to be treated in such a way? Or I can reflect on: Do I deliver the best work when screamed at? Can I stand behind offering risky investment products when I know that I am gambling with the whole money of a dad with three kids? Can I justify child labor because it is a cheap way of supplying my resources? How can I justify destroying nature through developing harmful products? I am asking each one of us to reflect on: Is this is all worth it just for the sake of generating more profits? I would like to give an outlook on how the future workplace will look like and show that the paradigm shift from being best in the world towards best FOR the world has already begun. Let us start with the individual, because everything starts with the individual, with us. How will we work in the future? Instead of playing a role we bring our whole self to work. We do not put on a mask when we put on our suit, but we are who we truly are in every minute. Everything we do and say is an expression of our authentic self, without hidden agendas. The separation between work and personal life continues to blur. It becomes one life time. Instead of having one life time employer, like my parents for example had, we work on different projects during our life. Project-based work increases with working on various assignments with different time perspectives, often having more than one project at the same time and sometimes having no projects at all. Our lives become more flexible to what we need, when we need it. If we need more money, we work more. If we need more time for our kids, we work less. We adopt a lifelong learning mentality, where we continue to learn new abilities instead of stopping to learn after graduation. This challenges our current life model of education, work and retirement. Maybe we do not want to retire at all, but work on small projects to continuously feel needed. And if we are still able to do it and enjoy it, why not? In the following we take a closer look on changes at the intersection of the individual and the organization. Especially for the Quaternary sector, which deals with knowledge based work, for example information generation and sharing like IT, Media or R&D, and includes services like consulting and education, work becomes more remote. Fewer fixed work hours at one specific place are required. A laptop and internet access is already sufficient. For the other three sectors of dealing with raw materials, manufacturing and services, people have to be at the production plant or out on the field at certain times, unless this work can be automated. For a functioning society we need all these different jobs and none is better than the other. I personally believe that the most needed jobs in our society are in the third sector, raising children or taking care of the elderly. Those jobs provide the highest meaning and feeling of connectedness, because here we interact with other people every day and see how they react to our actions immediately. I wonder why these jobs are often paid the least? The aim needs to be to improve the situation for all work groups. Often these people who daily interact with children, the elderly or customers, are the ones who know best what those people need. Therefore, the information and ideas should come from the bottom, the front line, the people who are closest to clients and not from one manager who sits isolated in an office. Instead of the managers that are far removed from the front line, decentralized decision-making increases. The people who have the most insights are empowered to make autonomous decisions. While we are at this, who needs hierarchies in such an environment? Instead collaboration happens on eye-level, on an equal basis. The person who is affected from a decision is able to state their perspective, provide feedback, give remarks, instead of simply obeying to orders. All this happens in an open dialogue, transparent to all stakeholders. Questions are asked to inquire into deeper understanding, instead of simply challenging the other. Information is shared. People are recognized for valuable input, instead of sitting on knowledge and withholding it from its application and use. People are driven by inner motivation, by meaning and purpose. We are inspired by why we work, instead of being motivated by external monetary incentives or avoiding punishment. We already talked about changes that also affect the organization, especially the management or leadership style. Now we have a closer look at organizational structure and design. The biggest transformation is away from large corporations towards loose networks of individuals or groups, who are hired as needed for projects based on their skills and expertise. Instead of being slow and inefficient bureaucracies, these networks are able to adapt to changes fast. In a lean way they create more value for customers with fewer resources. Organizations become human, corporate citizens, that focus on the impact they have on the individual human being, instead of only increasing profitability. There will be a lot of changes, some small and some big. The way we work will definitely look different in the future. Do not be afraid of the future. It might look different from what we know, but if we work proactively and together on it, then we are able to create a future that is better – for ourselves, the organizations we work in, the society we live in and the planet we live on. The Generation Y has the belief that everything is possible, but also has the understanding that if we do not take actions than we might not have another chance to influence the direction we take as humanity. We did not choose this burden for ourselves, it was handed to us from our evolution over time. We are not complaining about it. We accept our duty, because we know that at the end of the day we cannot live with the feeling of not having tried everything which is in our power. Our revolution is a silent one. Everyday we bring our best intention to work, like so many generations before us. And sometimes we enjoy a laugh and do not take us too seriously while taking a selfie with bunny ears. The Generation Y has different values. We look at the world from a different perspective. We value different things than older generations. This might make it difficult for older generations to understand us. We do things differently. We do not see the value of working till we drop in a meaningless, exploiting system, supporting the accumulation of wealth of the few. We value our own well-being, as well as the well-being of others. We value the well-being of the planet that nourishes us. The Generation Y values what has been achieved so far, but also sees the shadow of it. We do not close our eyes when we see the storm, we face it wholeheartedly. Call us naive, call us stubborn, call us dreamers. But do not call us lazy. We question to understand, to find alternatives. Our aim is to create improvement for the many, but we have understood that the first step to be able to do such work is to take care of ourselves. Do not mistake that for egoism. We are selfless, we care about the future and our unborn children. We are afraid of not having a satisfying answer when our children are old enough to ask us why we did not do anything when we had the chance to turn things around in our hands. Do not say we have unrealistic expectations. We are afraid that our expectations are not even high enough. We are driven by our hearts and are not limited by our rationality. The Generation Y is willing to cross boundaries and risks to get burned. Maybe we will never reach the ambitions we set for ourselves. Maybe our dreams will stay only that, dreams. But then I ask you, why not dare to try?